If you love to work with wood, adding a wood lathe to your workshop could take your shop to the next level. 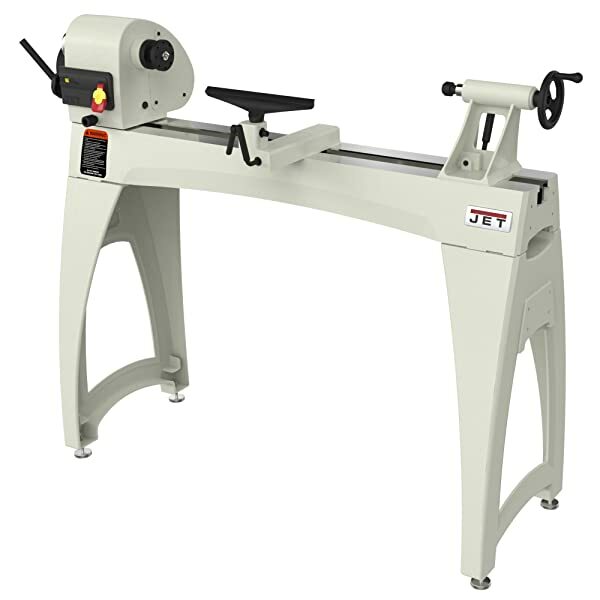 Whether you are a professional or you are just starting out, there are wood lathes that will meet your needs and help you perfect your skills. From inexpensive table-top models to heavy-duty stand-alone models, there is really something for everyone who enjoys working with wood. Adding a lathe to your workshop can give you the ability to create beautiful furniture accessories like spindles or table legs. You can also use them for useful items like pens, bowls, or baseball bats. 1 What is a Wood Lathe? 4 How to use a wood lathe? 4.4 What wood do you use? A wood lathe is a tool that is often found in workshops. Carpenters use wood lathes to shape a piece of wood by attaching it to a spinning arm. Then, they use different tools to shape the wood as it spins. Lathes are often used to make spindles, baseball bats, bowls, vases, or other items that are rounded. A lathe is a speedy alternative to carving a piece of wood. Wood is attached at the spindle and tailstock, then it is turned at a high rate of speed. Using tools with different blade shapes, bark is removed to create the shape and decoration that you want. These bladed tools are put on the tool rests so you can have consistent pressure on the spinning wood. Lathes can also be used to create objects that are hollowed out. With a lathe, decorations and shapes are evenly shaped in a way that is extremely difficult to do by hand. 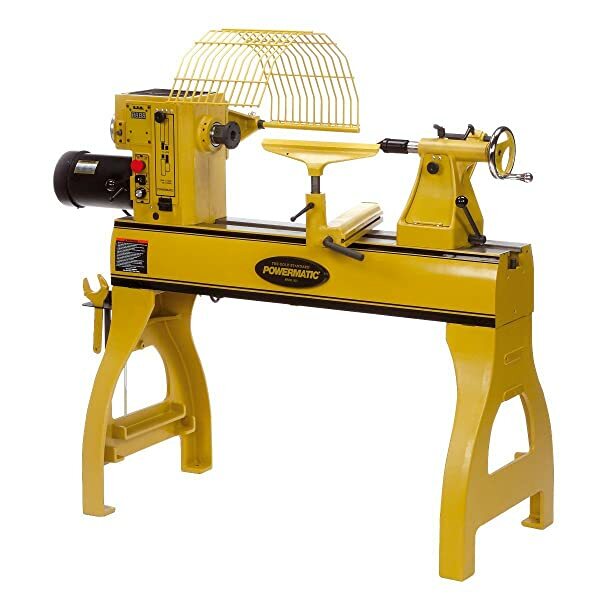 People who enjoy working with wood will want to have one of the best wood lathes in their workshops. These will join their favorite finish nailer and benchtop joiner along with other tools. It is a good idea to understand what features you want for a wood lathe, much like you did with your framing nailer or impact driver. Therefore, you should consider what you are planning to do with your lathe. Are you going to make large things like spindles, baseball bats, or table legs? Or do you plan on making small items like wooden pens or pieces for a chess set? 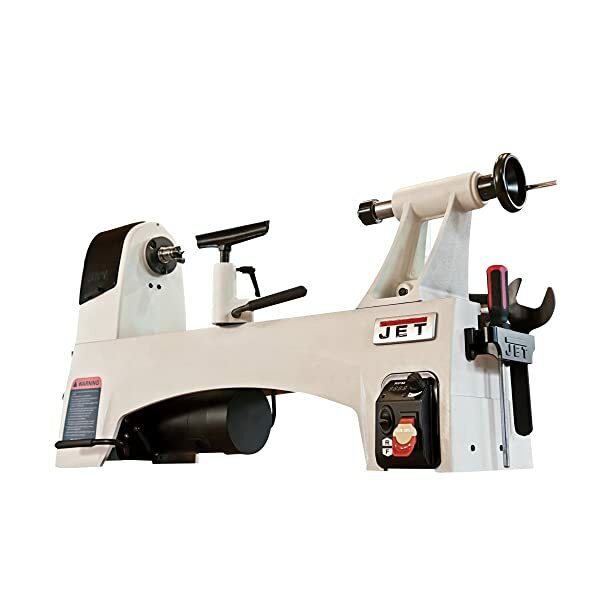 If you are planning on making large items, then you will want a bigger lathe made of iron or steel. But, if you are simply making small items like pens or toys, then you might be better served by purchasing a table-top model. You will also want to decide how you want to spin the lathe. You have two choices: electric or manual. The speed of a lathe can be adjusted with pulleys – the manual way. Or, you can get one that uses an electronic speed adjuster. The electronic version is easier for newbies, but that shouldn’t deter anyone from buying a manual version. Along with the adjustability of the lathe, the size and accessories are important considerations. Some lathes are huge, and you may not have room for those in your home, garage, or workshop. Some lathes also come with accessories, which can save you money over buying them all individually. 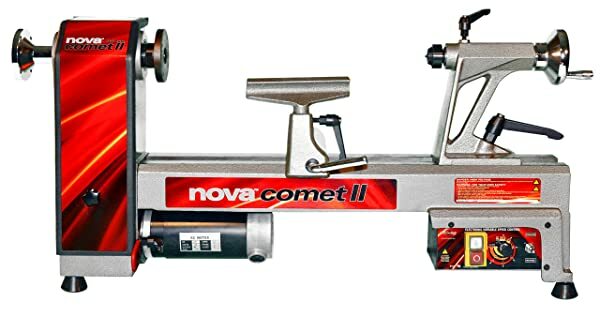 NOVA 46300 corded-electric 3/4HP 250 to 4000 12" 16.5"
JET JWL-1221VS corded-electric 1HP 60 to 3600 12" 21"
Powermatic 1352001 corded-electric 2HP RPM Digital 20" 34-1/2"
Jet JWL-1440VSK corded-electric 1HP 400 to 3000 14" 60"
Delta Industrial 46-460 corded-electric 1HP 1725 12-1/2" 16-1/2"
WEN 3420T corded-electric 1/3 HP 750 to 3200 8" 12"
RIKON 70-220VSR corded-electric 1HP 250 to 3850 12-1/2" 20"
Shop Fox W1758 corded-electric 2 HP 600 to 2400 16" 46"
PSI Woodworking KWL-1018VS corded-electric 3/4 HP 500 to 3600 10" 18"
The Nova 46300 is a great little lathe that functions like a big machine. It is designed for small spaces but is rugged and durable. You can get plenty of projects done with this great lathe. It has a ¾ HP motor with electronic variable speed that spins between 250 and 4000 RPM. You can choose the speed based on the project. It has a swing capacity of 12” over the bed and the center capacity is 16.5”. It will expand to 41” if you use the bed extension accessory. It includes several safety features, like the strengthened and reinforced composite guard with a rapid access latch. You can also quickly turn the machine on and off with the updated switch that is also fitted with a quick release, too. It is made of solid cast iron, so it is incredibly strong to withstand the pressure of the quick spinning. It has a three-step pulley system. Because the machine is built so well, there is very little vibration when it is at full speed. 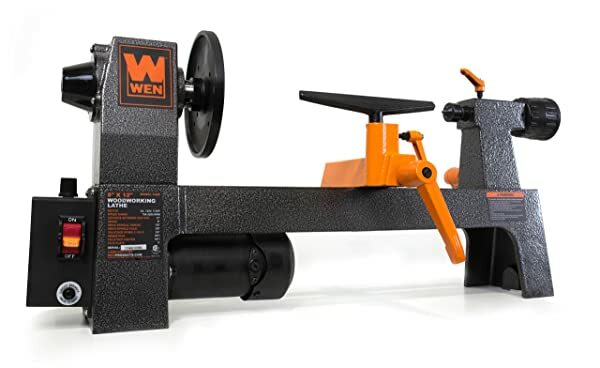 This is a great little lathe for your workshop. It’s speedy, yet offers outstanding control. The lathe spins at rates between 60 and 3600 RPM, so you can get the exact look you want. These speeds are chosen so certain designs can be carved. For safety purposes, the lathe has a spring-loaded spindle lock integrated into the it. It also has controls that are located for your convenience so you can smoothly spin the lathe forward, backward, and at different rates of speed. It is easy to select the speed you want with the digital readout. It has 24 integrated indexing stop positions and an Acme thread tailstock. It also has a unique ratchet-style tension system with innovative use of belts. This is a classic lathe with a sliding headstock and spindle lock, along with electronic variable-speed control so you can make some truly unique pieces. It’s easy to see the RPMs with the digital readout that’s convenient for veterans and rookies, alike. The Powermatic has a 20” swing and also stretches 34.5” between the centers with 24 different stops, too. The powerful, fan-cooled 2 HP motor can be used with a single-phase or triple-phase input. Despite the power, the lathe has very little vibration. This is a heavy lathe, weighing in a 682 pounds, so it stays put, despite the work you are doing. It’s made of iron casting and has a storage space that holds tools and accessories. The Powermatic comes with a five-year warranty. This lathe is another heavy, professional-grade option, though not as heavy as the Powermatic. At 400 pounds, it stays put when you are working. The headstock pivots 360 degrees and has 7 positions that lock at preset degrees. The lathe spins at rates between 400 and 3000 RPM that can easily be read on the RPM display. It includes safety features like an improved tailstock quill that locks. The tool rest locks with an updated clamp feature. It also hs extension bed mounts with three positions. It has Acme threads in the tailstock. Unfortunately, it does not spin in reverse. 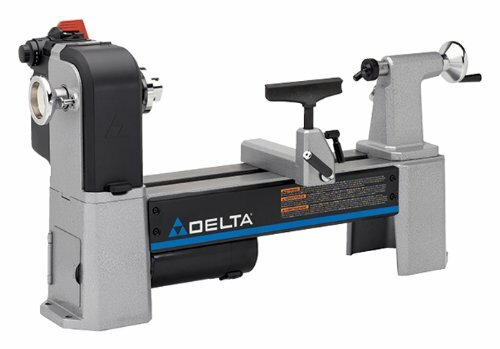 Delta builds high-quality tools, including brad nailers and framing nailers. This lathe is no exception to the rule of high-quality products. 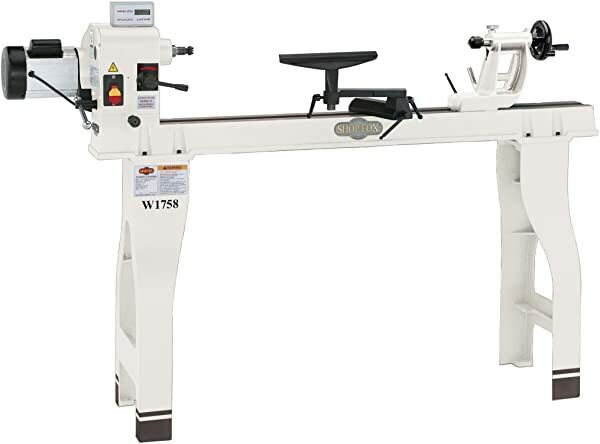 It’s a table-top lathe with a live ball-bearing center and 12.5” midi lathe handles designed for professional woodworkers. It has a 1-HP motor with three pulley-speed ranges that allow for forward and reverse. It only takes the flip of a switch to change the speeds that range between 250 and 4000 RPM. The lathe comes with a three-inch faceplate as well as two tool rests. 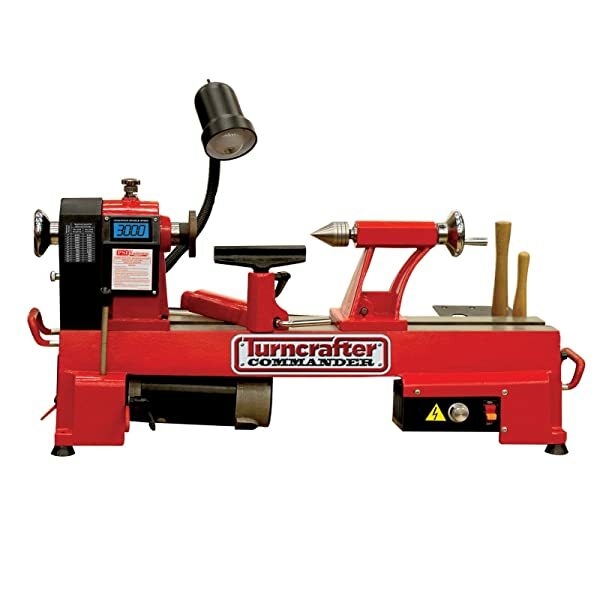 The lathe is made of durable cast iron and comes with a five-year warranty. The lathe spins at RPM between 826 and 3337. For safety purposes, it does come with a face plate. Unfortunately, the little motor does get rather hot when it’s in use. It’s a nice little lathe, but the motor and the single tool rest make it a good model for beginners, who will probably want to upgrade as their skills develop. If you are looking for a table-top model to have in your home, this is a great choice. It’s small and perfect for making small things like chess pieces or pens. The motor spins at rates between 750 and 3200 RPM. The motor runs at 2-amps and the lathe has a pair of interchangeable tool rests, as well as an MT1 spindle and tailstock taper. For safety reasons, the lathe comes with a five-inch faceplate. The lever clamping system lets you make easy adjustments. It comes with a flat wrench, tailstock cup center, and several more accessories. The lathe weighs about 40 pounds, so it is easy to store when not in use. 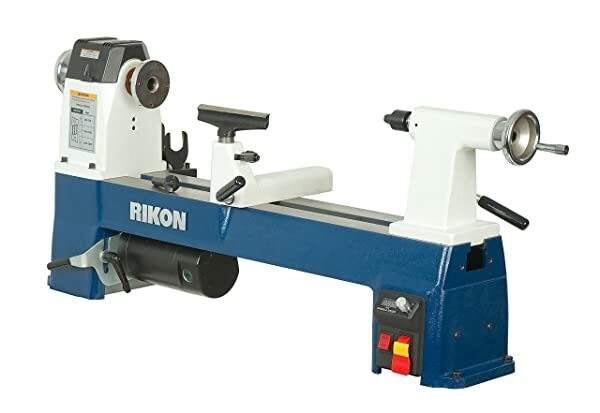 The Rikon lathe has a 1-HP motor that makes it powerful enough for nearly any type of woodworking. The late has a turning capacity of 12.5” diameter swing with 20” between the centers. The index has 24 preset stops so you can design ornate bowls, pens, spindles, and more. The Rikon spins at rates between 250 and 3850 RPM and the exact rate will be displayed on an LED panel. This table-top lathe can spin forward and in reverse. It is a heavier option at over 120 pounds and has two Morse tapers. This powerful lathe is a good choice for beginners and for professionals, too. With a 2-HP single-phase motor, this heavy-duty late runs at speeds between 600 and 2400 RPM. It has a cast iron bed and legs to reduce the vibration. Speeds are adjusted with a lever. The tailstock and headstock are released and locked with a quick lever, too. The headstock rotates to different preset degrees. The lathe comes with several accessories including a six-inch faceplate, a spur center, and a live center. It also comes with a tool rest that has a swivel arm that can be adjusted three different ways. The lathe is heavy, but this makes it durable and less likely to vibrate at high speeds. This is an updated PSI model, replacing the TCLC10VS. It has a ¾-HP motor with variable speeds and two belt positions that spin at rates between 500 and 3600 RPM. This modern lathe includes an SBC microprocessor for precise spins. The lathe includes several accessories including a one-inch headstock thread, a pair of 2MT tapers, and a cast iron base. The swing over is 10 inches and the distance between centers is 18 inches. There are 24 indexing positions that include spindle locking. It also includes two tool rests, one 6” and one 12”. It has a 3” faceplate along with a set of hex wrenches, Phillips screwdriver, and safety goggles, too. How to use a wood lathe? Using a wood lathe is not something that most people can do perfectly the first time. It is a tough skill to learn and requires significant practice. The skill involves taking a block of wood and carving it into something symmetrical, like a bowl, a spindle, or a pen. This is done by using tools, like chisels, to carve the piece as it spins at variable rates of speed. Lathes come with tool rests, so the chisel can rest at a set angle. Lathes are considered power tools, like a floor nailer or roofing nailer, but it is actually a relatively safe tool to use. Despite the fact that lathes do not shoot nails at high rates of speed, there are still recommended safety practices that should be followed at all times. They include frequent inspections of the lathe, to be sure that all of the fittings are tight and in place. It is also important to keep the work area free of any unnecessary debris. Tools should also be kept clean and sharp so they do not catch on the spinning wood. It is also important to have a well-lit and well-ventilated workspace. When you choose your piece of wood, be sure it is of the highest quality as shoddy wood with unexpected knots can damage the lathe and your tools, too. It is also important to protect yourself while using a lathe. The most important safety equipment includes clean safety goggles and many people also like to use a dust mask so they do not breathe in the small pieces that come off during carving. It is also wise to wear clothing that fits well and is not baggy or loose because it could get caught in the spinning pieces. Using a lathe gives woodworkers opportunities to create beautiful things like unique spindles. These are created by making v-grooves, square cuts, coves, and fillets – that can be made with four easy-to-use tools. But, the unique carving details cannot be made until the shape of the spindle is created. To do this, you need to use a roughing gouge, which is one of the first things that beginners need to learn. After that, beginners can learn to use the skew chisel, which is used to make square cuts. This chisel can also be used to shape and plane a piece of wood, but this type of chisel often grabs the wood. Therefore, it is important to learn to use it properly and to be sure it is sharp prior to putting it to the piece of wood. The parting tool is another important accessory that beginners should learn to use. This is what will break the finished piece from the stock. If you consider the name “parting tool” – it is easy to remember what this tool does. It is also used during carving sessions to make square-shaped grooves in a piece of wood. If you are looking into buying your own tools, the ones made of carbide are good choices that are easy to use and extremely durable. While you might want to use the traditional choices, they can be finicky for beginners. With carbide tools, you simply replace the tips, but traditional ones need to be sharpened. When you take the lathe out of the box, you have to put pieces in the proper places. The spur center and live center need to be put in the right places so they meet in the middle. Some people like to use lubricants to keep the lathe spinning smoothly. Always check the lathe to be sure that everything is tight and secure. Most woodworkers begin at low speed to ensure that their piece of wood is centered. It will wobble if it isn’t. The low speeds also let you see if the wood has flaws that could cause the wood to break or your tools to catch. Whatever wood you choose should be high quality. But, beginners have more success with softer woods, like framing lumber. But, any good quality wood will spin and you can pick the wood that you like the most. Eventually, you will find a favorite – maybe it will be maple, oak, cherry, or something more exotic like mahogany or bubinga. It is possible to use both wet and dry wood. If you do use wet wood, it will shrink after it dries. But, wet wood is rather fun to use because it is soft. However, some wet wood needs to dry for nearly a year before it is ready to use! It is very helpful to take a class from a professional or watch videos to see exactly what to do. Working with a lathe is rewarding as you get to be creative while the wood is spinning. 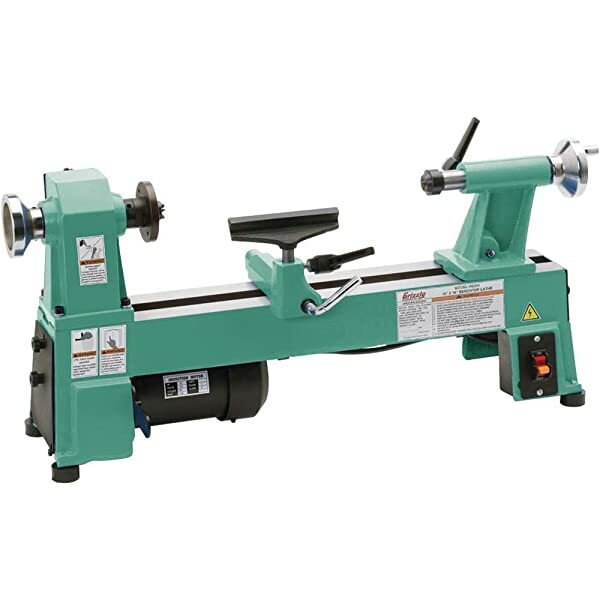 Lathes come in a variety of styles and prices. Your ability to work with wood can help you determine what is best for you. If you are new to working with a lathe, a smaller, table-top model might be best. But, if you are experienced, a large professional-grade model will give you what you need to create a range of products. Before you make your choice, consider the slowest speed of the model and the ability of the motor. Not every model comes with slow enough speeds, especially for beginners. And, some of the motors might not have the necessary power to keep a speedy lathe spinning consistently. No matter what lathe you choose, be sure you only use it in the safest conditions. Wear your goggles and dust mask t o keep yourself protected from any possible accidents.